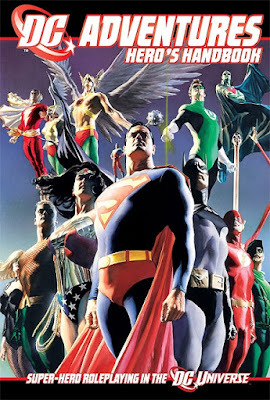 Spend any time here and you will know that I am a HUGE DC Comics fan. Yeah like many others in the 80s I read the X-Men and of course Spider-Man before that. I know Marvel, but my love is DC. So it is with some joy (and some anxiety) that I let you know about a huge sale Green Ronin is having on their DC Adventures RPG. All four books are on sale for $5.00 each. Not a bad deal really. Scratch that, that's an excellent deal. This is the core book and the only one needed to play the game. It is based on Mutants & Masterminds 3rd Edition, which is also a fantastic game in it's own right. The book is jam packed with great DC art. All of the art and the write-ups are pre New 52 and pre Convergence. But you know what, who cares! This is DC which means Batman, Superman, Wonder Woman and Booster Gold! (ok so maybe Booster is not a reason to buy this...actually Booster is not in this book iirc). You can plan in any DC world you like. Hell you can (and should really) play in the future with Terry McGinnis as Batman. Mix in Oliver Queen from the Arrow TV show, Isis from the 70s "The Power of Isis" show and the Birds of Prey from their short lived TV show and do what you like. All you need is a d20. I personally like to use a clear green one since it looks like Kryptonite. The A to Z guide of heroes, villians, organizations and even some places of the DC Universe. Very nearly everyone is here in one form or another. The "world book" or campaign guide for your games. Great in that has some stats but it can't cover nearly 80 years worth of DC history, nor does it try. It focuses on the then most current version of the DC Universe (Pre-New52 and just after the "Darkest Night" arc). If you have read a DC comic then you know what you are in for. If you have only seen the Batman movies then you are in for a treat to a much larger and much more interesting world. Not sure if this is the game for you? Then try the DC ADVENTURES Quick Start PDF. Now. I have heard a rumor that Green Ronin will be ending their DC license. That is really too bad, but not unexpected. Licenses cost money and the product doesn't always reach enough people to make it worth while. I have (personal) experiences where a licensed product doesn't sell to the larger fan base of the license. But no worries since I have my books and my PDFs. The DC ADVENTURES game is also 100% compatible with (the same game as) Mutants & Masterminds 3rd edition. So as long as we have that then we can play all we like. Maybe Freedom City can be part of YOUR DC Universe. I have spent a lot of time with this game and plan to spend a lot more. Here are some character write-ups I have done over the years. I have two "DC Universe" games I want to try out sometime. Both are mostly based on the current TV universe (aka the "Arrowverse"). One is the "The Incredibly Awesome (and Not At All Made-Up) Adventures of Booster Gold and Blue Beetle!" the other takes place in that universe but is more a rif on the "I, Vampire" storyline of the New 52 comic era. The "big bad" of this one is going to be Dracula, something I have always wanted to do. I'll either use my version of Dracula (which I'll need to update to 3e) or the official M&M3 one, but upgraded. I have always wanted to use Dracula as my big bad, especially against "street level" heroes. Labels: dracula, mutants masterminds, supers, TIA(aNaAMU)AoBG&BB! Folks can also pick up all the DC Books from Green Ronin's store in print for only 10 a piece. I saw that. They are great books. Really sad I missed out on this. I had eyes the books when they were released but couldn't afford it at the time, now they're extremely difficult to find. Yeah, what's up with that? Did they lose the license? Licenses expire all the time. Could be there was a fixed time for publication.